Palin knew that coming back to Alaska wasn't going to be fun and that she'd face a lot of criticism. Her response has been to withdraw. Excluding the budget and appropriations bills, which are mandatory, she has introduced next to very little legislation. In his third legislative session in office, Murkowski introduced 32 bills and saw 19 made into law. In her third session, Palin has introduced 12 bills  none that could be considered sweeping measures  and only one has made it into law. But Palin has spent a lot of time saying no. She fought to reject federal stimulus money, even though Alaska's legislature is expected to override her final veto of 3% of the funds intended for Alaska. She also spent a great deal of effort trying to keep a Democratic representative from taking a vacant state senate seat. Juneau representative Beth Kerttula, a former Palin ally on energy issues, made the mistake of going on national TV and saying that Palin wasn't ready for higher office. Over the space of six weeks, Palin not only rejected Kerttula but every Democrat put forth by the Juneau Democratic Party for the vacant seat, bringing the state senate to a near standstill. On the last day of session, Palin finally accepted a neutral candidate, former Juneau mayor Dennis Egan. "The governor was on the brink of being taken to court in violation of appointment statutes," says senator Hollis French, an Anchorage Democrat. "All because she was trying to rebuke Beth, who during the campaign said one or two things that weren't ingratiating to the governor." Meanwhile, Palin's attempts to engage on the national stage have flopped. Partly because Alaska is so far away, her trips outside the state were noticed by Alaskans, and may well have affected her ability to govern. When she nominated a highly controversial figure for state attorney general, for example, most members of her own party joined the vote to reject him. Palin might have been able to persuade them to support the nomination, but she was out of the state, speaking to a pro-life group in Evansville, Ind. She has also found it increasingly difficult to campaign and fundraise for 2010 congressional candidates, and her Twittering from Wasilla is like shouting from the top of Mount McKinley for all that it's heard in the lower 48. The only news that does break through nationally are tabloid items like her fights with Levi Johnston and David Letterman. "I buy that you want to spend more time with your family, the stress and demands of five children and a husband. I can buy that you want to push your conservative agenda. I would buy that she thought that she could do more on a national scale because of her popularity and because of her Hollywood stature," says representative Charisse Millett, an Anchorage Republican. "But the lame-duck analogy  you don't do that. You don't quit the game. I wish that she could've been a better example for my daughter and Alaska's daughters." Between her husband's income and her own salary, Sarah Palin is by no means poor. But the Palins have had to spend more than $500,000 to deal with the 15 ethics complaints filed against Palin by various outside groups in the past eight months. Palin has been exonerated in all cases, but Alaskan law states that she has to use her own money to defend herself. More cases were expected, which could've become expensive with four kids (and a grandchild) still living at home. 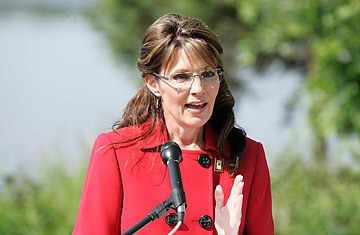 Quitting frees up her time for speaking engagements; politicians of Palin's stature get as much as $50,000 a pop. "I don't think Sarah Palin is a politician. I don't think she wants to be a politician. I think she wants to be an inspirational leader," says representative Mike Doogan, an Anchorage Democrat. "She has the opportunity to make a drop-dead amount of money in the next 18 months." Without resigning, she might have been looking at more than $1 million in legal fees over her remaining 16 months in office. Now she's looking at an unlimited, and very green, horizon.